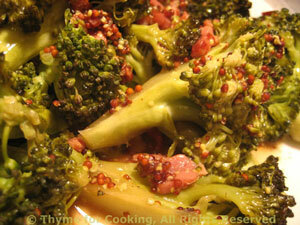 Broccoli, Bacon, Red Wine Vinegar, Thyme for Cooking German Style sides. This could be called 'German-Style' with the hot mustard, bacon and vinegar... We just called it delicious! Put into a medium skillet with 1/2" (1.5cm) water on the bottom. Cover and simmer on medium heat for 8 -10 minutes or just until done, careful not to overcook. Remove from pan and set aside, discarding water. Cover to keep warm. Cut bacon into sticks. In the same pan sauté bacon until crisp. Add water, vinegar, mustard and stir well, reducing slightly. Add broccoli, stir well to coat. Heat through and serve.